In Hope Stories The Archbishop of York, John Sentamu, shares with you twenty handpicked, hope-inspiring stories from ordinary people with extraordinary experiences. In this follow on to his Faith Stories, individuals explain how their trust in God gives them hope and how it makes a real difference in their lives as they face up to difficult personal circumstances. With each unique and compelling testimony to the resilience of Christ's gospel, Every day, so many Christians are living out their faith in their communities, being open and listening to God as they accept new challenges and new ways of life. John Senamu reveals how these ordinary faithful followers of Jesus are using what skills and talents God has given them to help others find a relationship with him, live their lives and prove the gospel message. In this authentic and engaging compilation or real life accounts, 20 people with everyday lives, families and jobs explain how their experience of Christ gives them hope in even the darkest times. People who, despite terrible personal circumstances tell how they found hope in the face of terminal illness, persistent drug addiction, deep depression and even temptation to suicide. All have found strength through their personal relationship with Christ. John Sentamu gives you a personal introduction to each hope filled story and the book as a whole is an inspiring demonstration of Christian faith in everyday action. With a photo of each person who contributes their story, this is the ideal companion to the bestselling John Sentamu's Faith Stories. John Sentamu's 'Faith Stories' shows you ordinary men and women doing extraordinary things, encouraging individuals to live out the Gospel and really making a difference in their own lives and in the lives of others. John Sentamu's Stories Value Bundle by John Sentamu was published by Eden bundles in November 2016 and is our 23812th best seller. The ISBN for John Sentamu's Stories Value Bundle is EDENBUNDLE-1784. 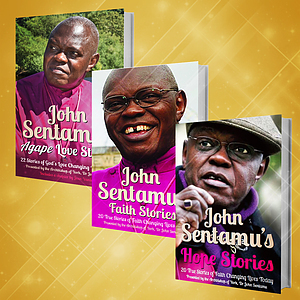 Be the first to review John Sentamu's Stories Value Bundle! Got a question? No problem! Just click here to ask us about John Sentamu's Stories Value Bundle.